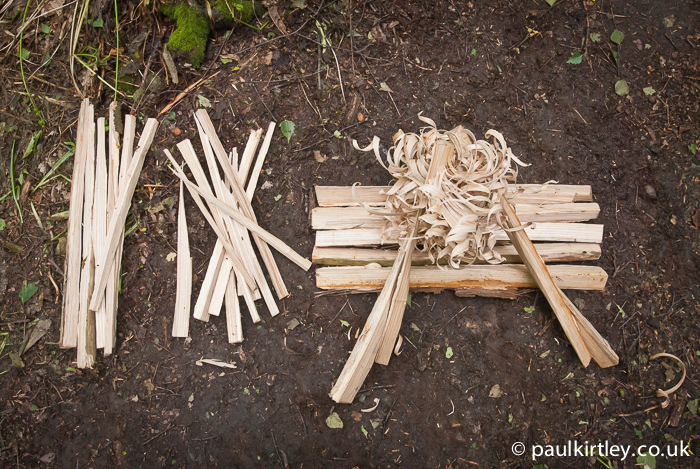 Split wood has many uses in camp and on the trail. 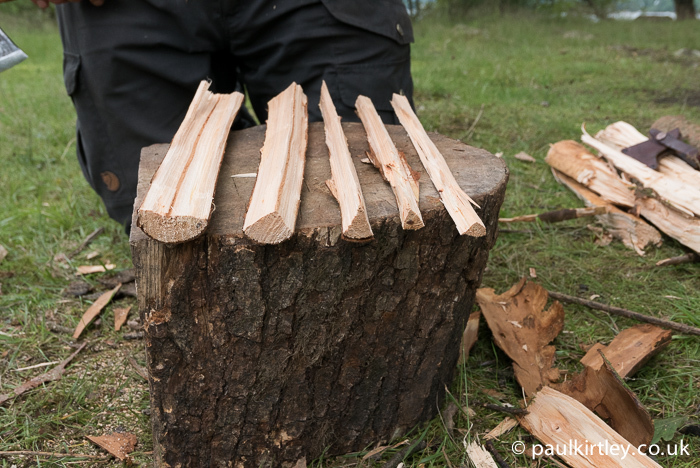 From dry kindling and feathersticks to improvised grills, small-diameter rounds of dead, dry wood split down into smaller sizes are an important resource for fire lighting and fire management in particular. 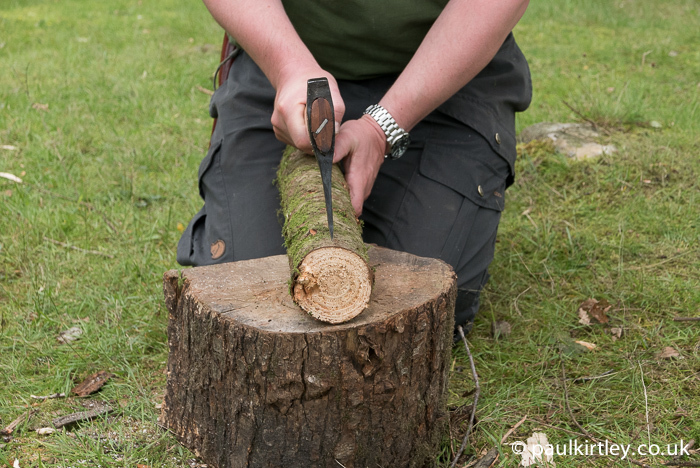 In circumstances when you stop for the night in the woods but cannot find dry wood in a suitable condition for starting a fire, splitting out dry wood is a reliable means of obtaining the small-sized fuel you need. 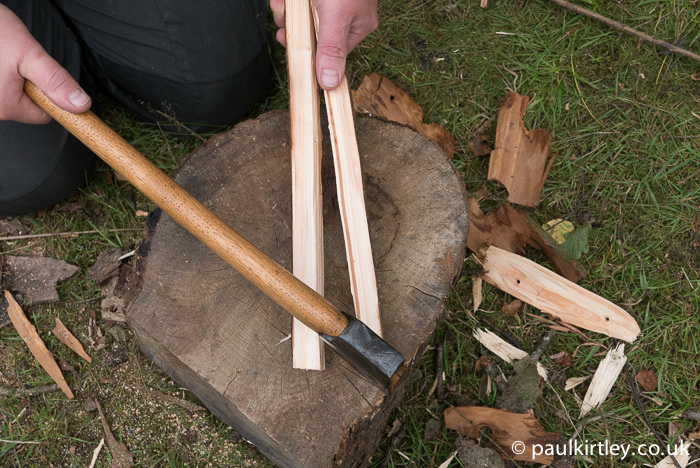 Even in cabins when there is plenty of firewood in the woodshed, you still may need to produce small splints for kindling from heavier rounds. 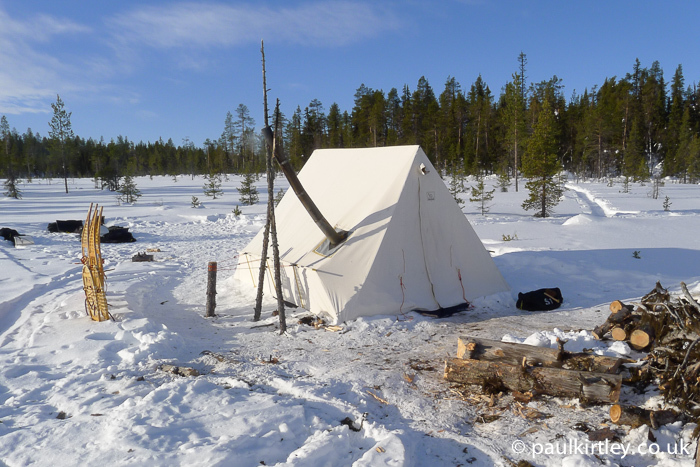 Plus we’ve all experienced popular camping sites, where small sticks are at a premium. 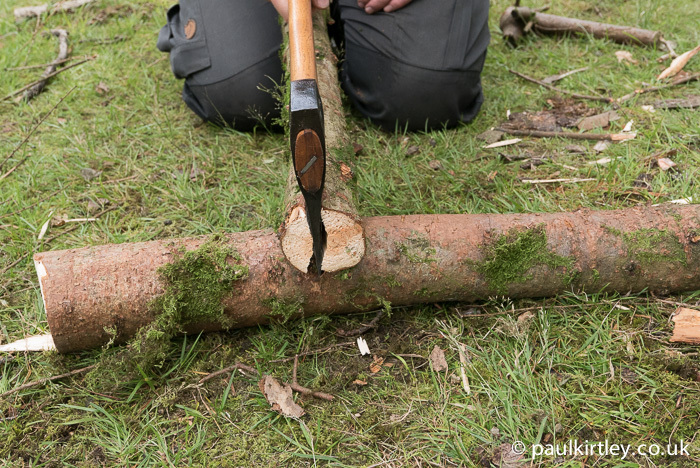 Being able to take dead standing wood, cut it to length then split it down, provides all the sizes of fuel you need without any fuss or stress. 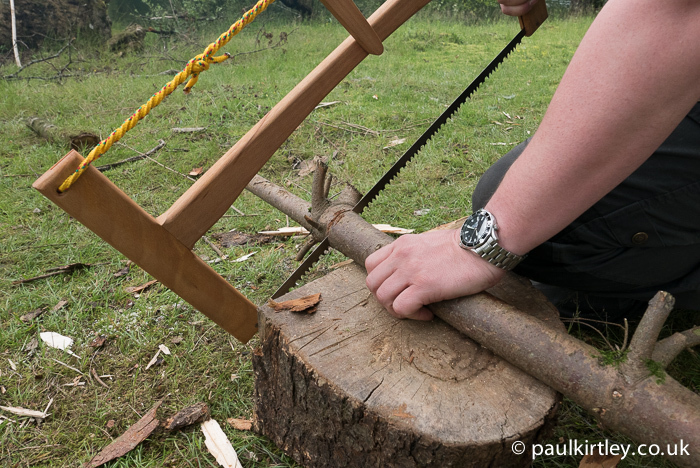 I’m putting an emphasis on splitting wood for fire lighting and fire management but the techniques below are by no means limited to just this purpose. It is, however, the purpose for which you are most likely going to be using them. 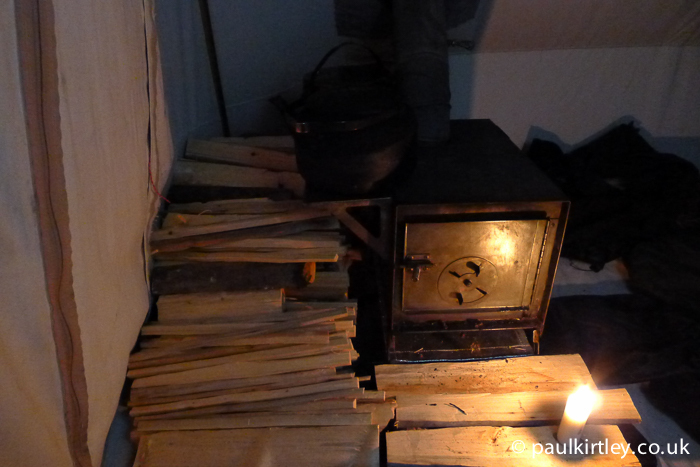 Unless you are using modern camping stoves with liquid fuel or gas, fires for cooking and warmth are an everyday requirement, especially in the colder months of the year. So, these techniques become an every day practice. 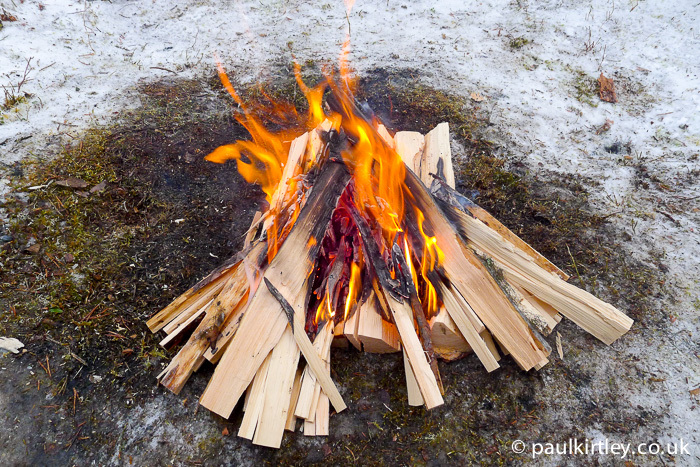 I’ve used these axe techniques most when winter camping but, as illustrated here, they are useful year-round, in fixed camps and on the trail. 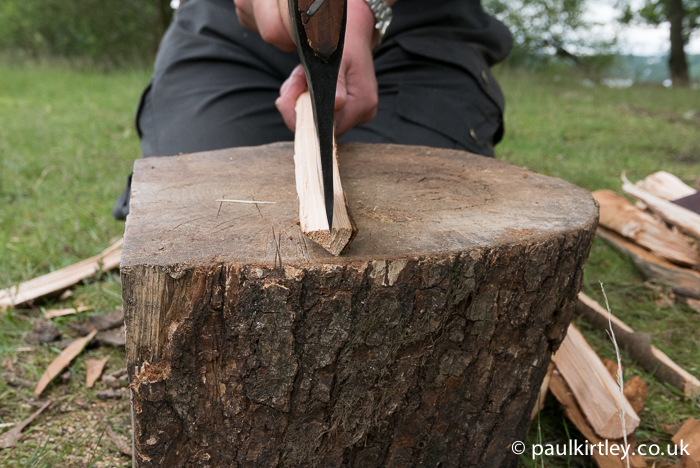 As emphasised in my axe safety in camp article, kneeling is the best way to mitigate risk of injury when using a short-handled axe on a low block or stump. Most splitting techniques are very dynamic, requiring fast movement of the axe. They also require good aim – hitting the wood in the right place to split it. 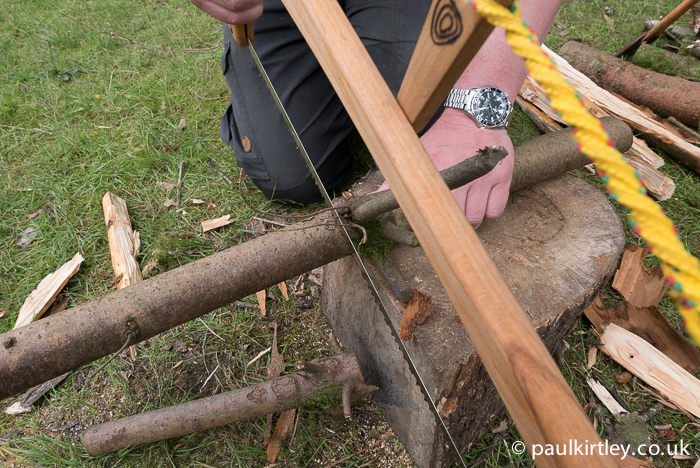 If you are standing a round of wood on its end, aiming to hit it with an axe, this becomes increasingly difficult the smaller the diameter of the wood. It also becomes harder to balance the wood on the block in the first place. The technique I’d like to share with you now involves much less dynamic movement of the axe combined with easier aiming. In fact you do the aiming first, before you swing the axe. 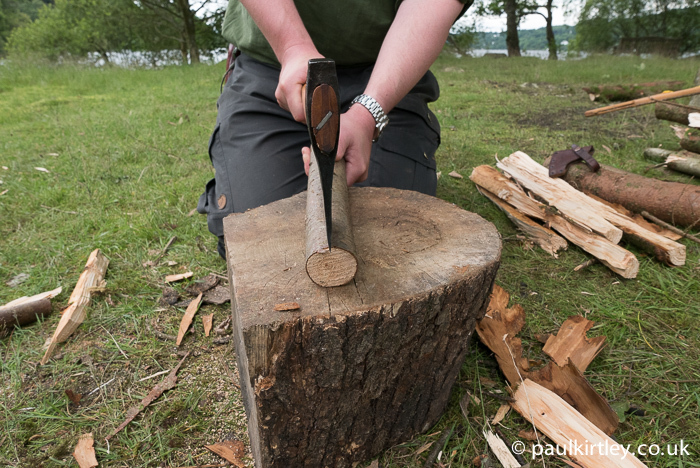 What you are going to do is place the bit of the axe onto the the round of wood at one end. 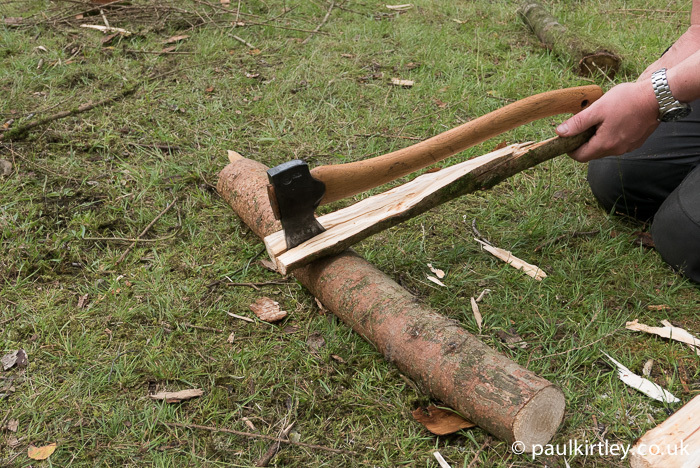 The handle of the axe runs pretty much parallel to the wood you want to split, along the line you want to split it. 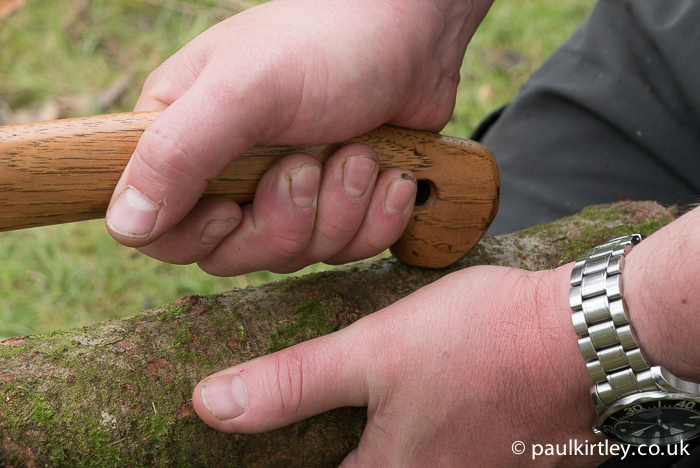 Knotty wood is harder to split than wood without significant knots. 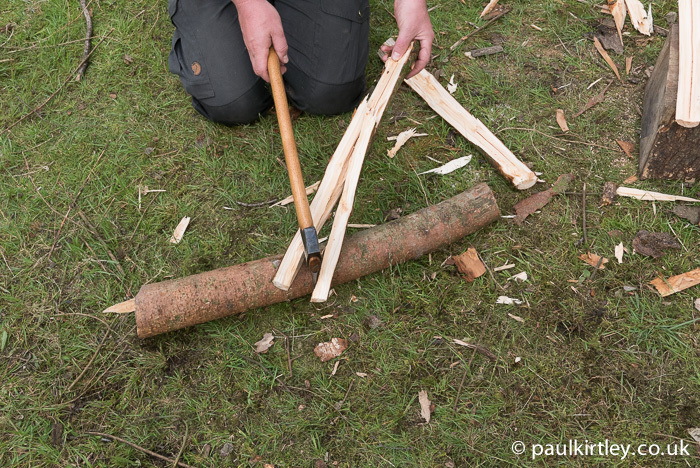 From the perspective of splitting, knots effectively create a peg through the wood, holding it together. 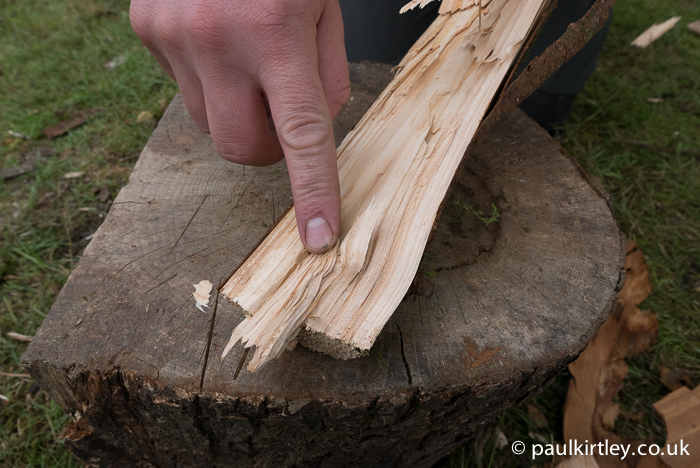 This makes a knotty log, even a small, relatively thin one, harder to split. So try to select the least knotty pieces of wood to split. This starts with how you cut the wood down to the lengths you want to split. 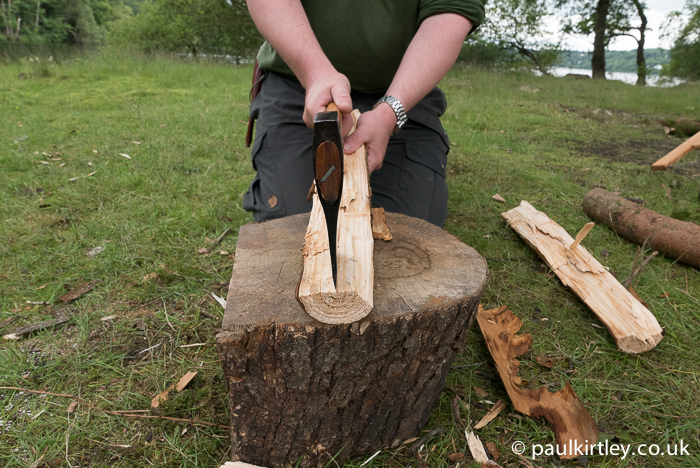 Being intelligent in how you section up the wood you are going to split will save time and effort later. 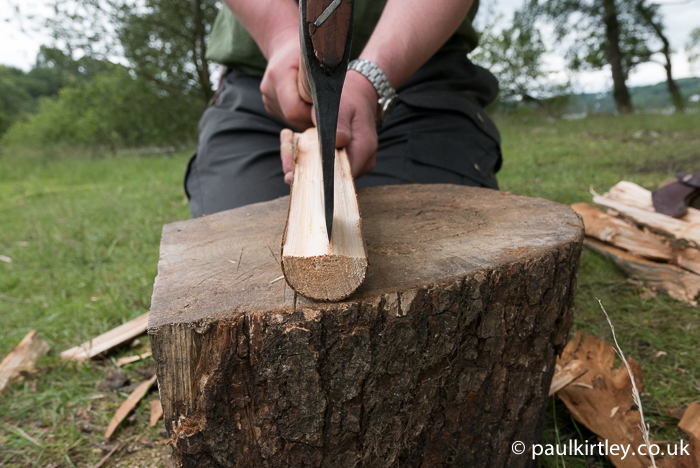 Making the splitting easier also makes it less likely to result in an injury from the axe. 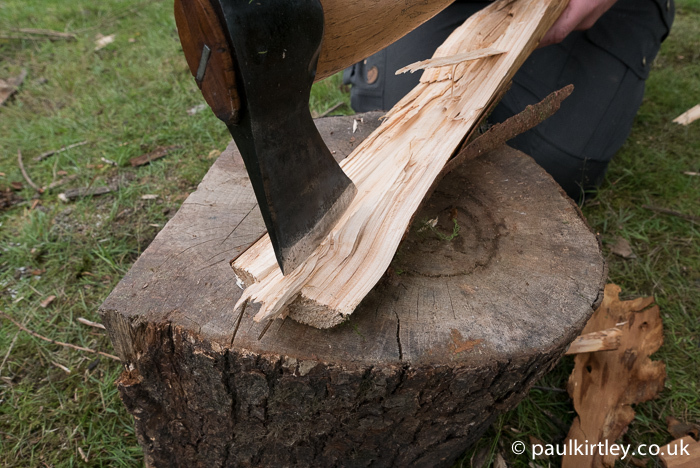 Once the piece of wood is split down most of its length, the split can be completed by prising the axe and wood apart. 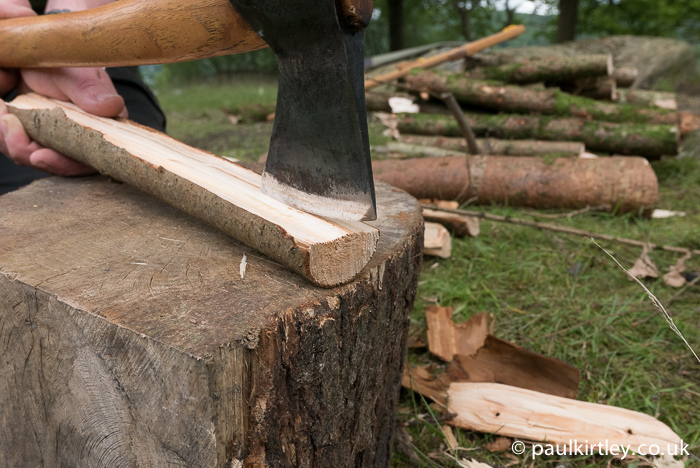 With easy-to-split pieces of knot-free wood, even using a light touch, it is likely that sometimes the axe will enter the block. 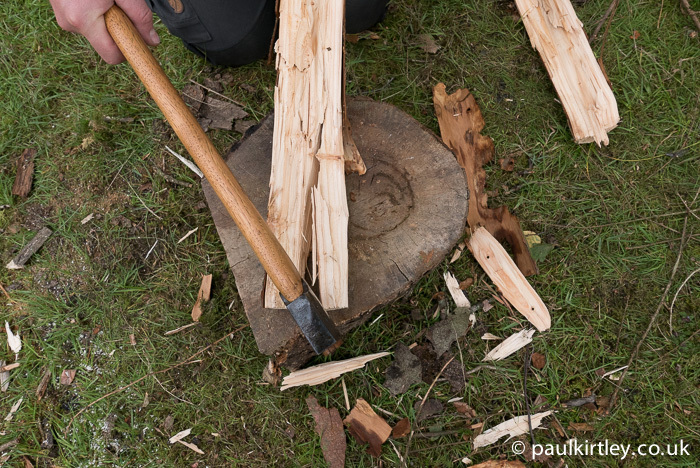 With tougher, knotty pieces where some force is required, it is very likely the axe will end up in the block. So, right from the start you should get into the habit of generating the prising action by moving the wood, not the axe. 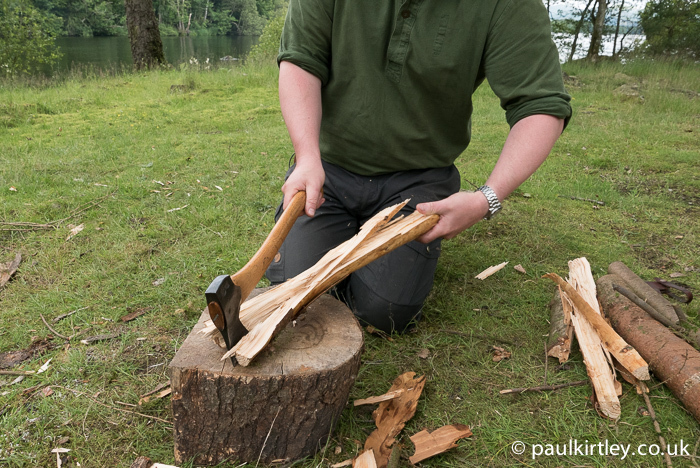 Trying to move the axe handle horizontally after it is embedded in a block will result in you trying to rotate the whole block, putting considerable stress on the part of the axe where the head is attached to the handle. Over time, this can work to loosen the mating of head and handle. Once the round has been cleaved into two, exposing the grain inside, splitting tends to become easier from this point onwards. Even so, we should work to be as efficient as possible. 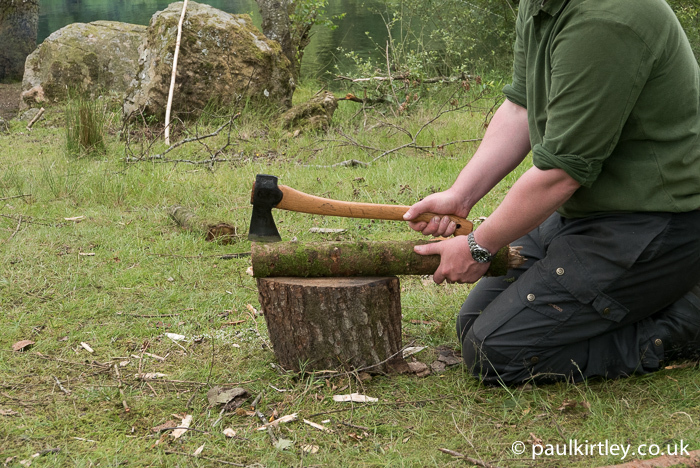 In particular we should think about the ease of maintaining the axe placement on the wood. Every piece of wood is unique. Some pieces harbour unseen knots. Some species of tree split more easily than others. Employing this splitting technique won’t always be like putting a hot knife through butter. 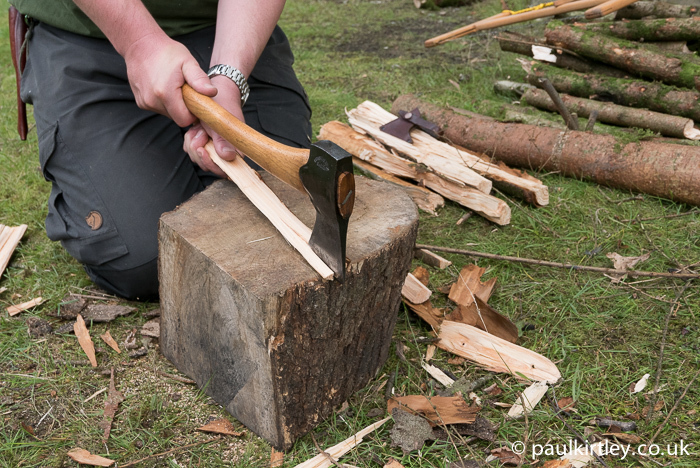 First off, you should know how to remove the axe from the round of wood, should the wood not split. The critical point is to keep your fingers well out of the way. 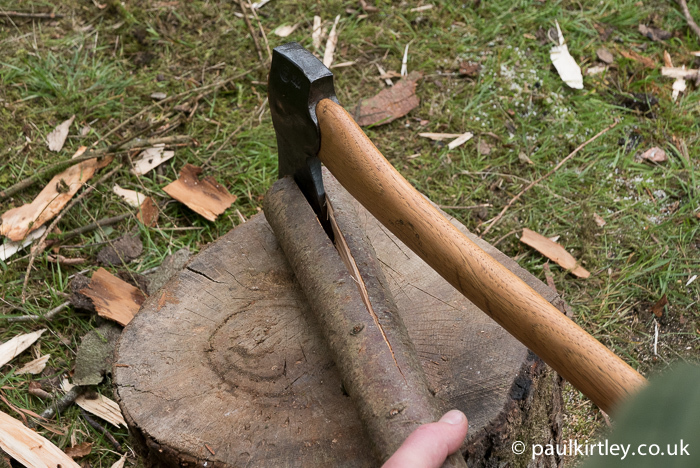 Levering an axe versus a piece of wood creates an excellent guillotine for your fingers. Make sure they are no-where near the axe head. 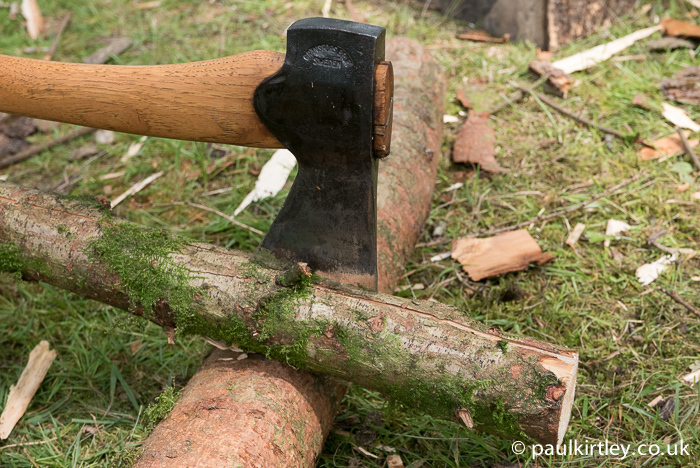 A second concern, but also important, is what the axe will do when it is free of the wood. The more force you are applying, the more it can accelerate as soon as there is nothing to oppose the force. 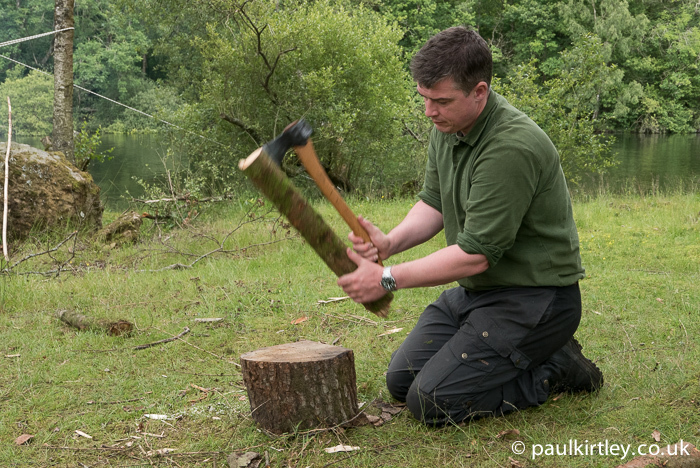 Make sure the axe is not going to come out towards your arm or drop onto your leg once it is free. What If There Is No Block? 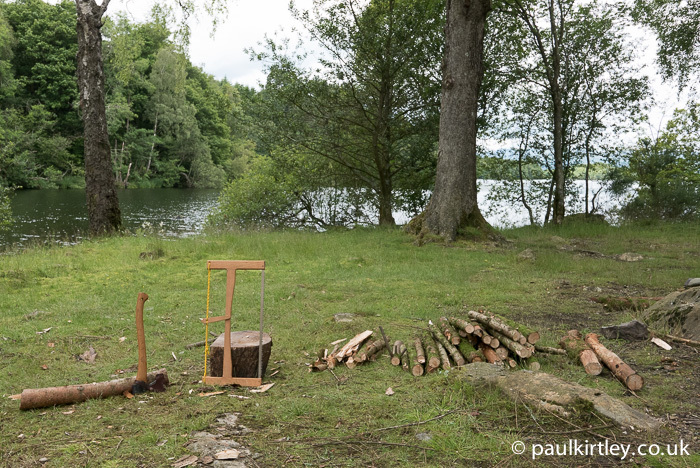 Unless you are camping at a spot where you or someone else has previously left or created a chopping block, you will not have one to work on. 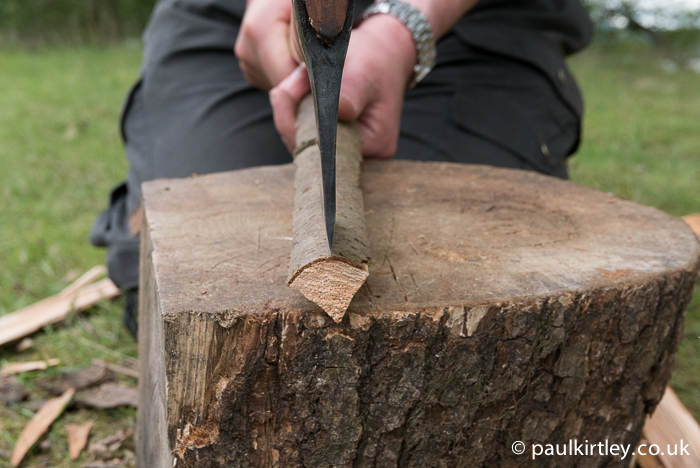 Unlike other splitting techniques, which depend on a log being balanced on a flat surface, the technique we are examining in this article does not require a flat surface. 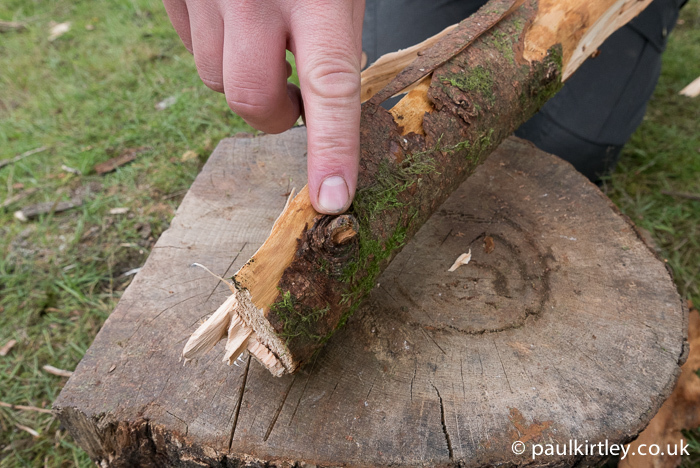 You can work onto another log, even a relatively small one. 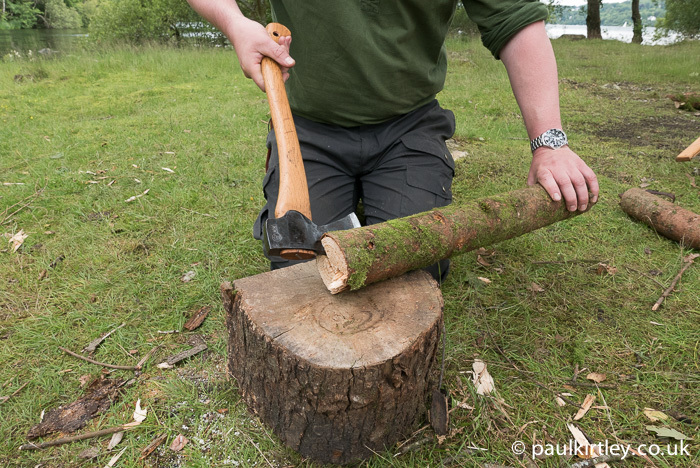 A note of caution here, though, you should make sure that once the piece of wood has been split, your axe does not continue onwards towards the ground. On rock, the damaging results should be obvious. But even soft earth will contain small stones and sandy particles, which will dull or even damage the cutting edge of the ace. There may also be more substantial pieces of rock hidden beneath the surface. So, where you place the axe over the piece you are splitting and the log you are working on is an important consideration. 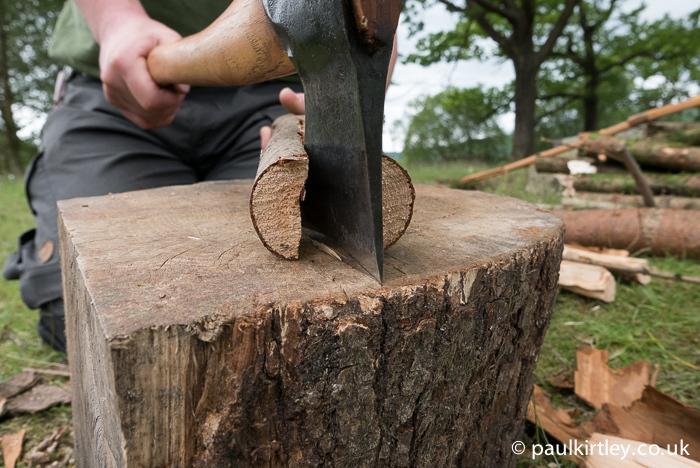 Keeping the axe bit, wood you are splitting and log you are working on all in alignment also provides the most effective transmission of force in generating the split. The above splitting technique is one of the most useful I know. It’s certainly the most frequently used around camp, whether close to home or on wilderness journeys. 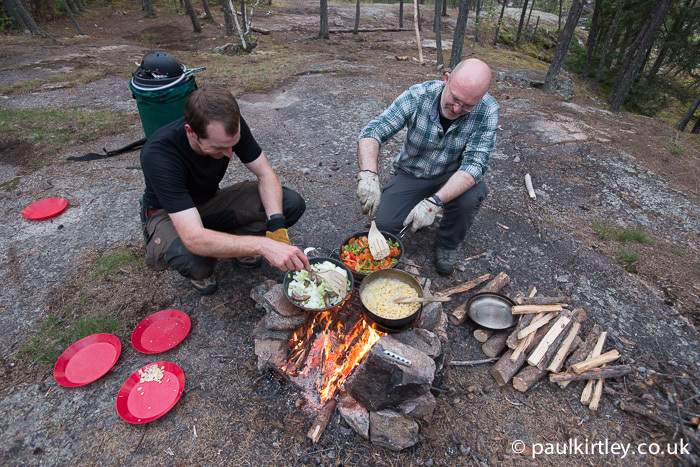 I’ve used it from canoe trips in Canada in the summer to winter camping trips in the far north of Scandinavia. 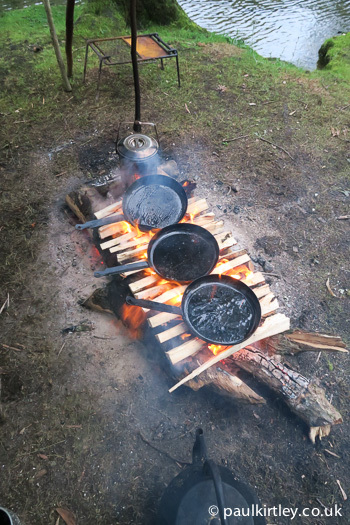 For producing suitable fuel sizes for campfires or stoves, this technique is particularly valuable. Moreover, due to it being less dynamic and more controlled than many free-hand splitting techniques, this splitting technique is relatively safe to use in confined spaces and near to other people. I hope you find it as useful to have in your repertoire of axe techniques as I do. A great article, some really good and practical advice. Brings back memories of last years axe/camp craft course. Hei Paul and everyone! Really nice article! I knew about this technique from your video but here it is bit more expalined and with more details. I was just looking to the last to pictures and thinking about how bad I feel always when I´m camping and I wanted to ask/share with you guys. The point is that for example here in Norway, you can chop wood (well, you “can” but of course there are rules) but the thing is that I feel kind of bad specially in the winter when one needs tons of wood to keep warm and I wonder how me, just a guy, is choppong wood just because I have the will (not even the need) of being outside. Of course these could lead to an almos philosophical topic about being outside nowadays, but I guess you know what I mean. This ends up for me in not enough wood or a bad feeling after cutting 1-2 small trees more than what I wanted. How bad it REALLy is for a forest? How long new trees take to grow? Of course it depends on the area, the state´s plan for forests and so on. I mean, look at all that wood we chop. And we probably use few. Larger groups ot longer trips take much more. May be it´s stupid, but I just can´t stop thinking about it. Great article and pictures! I have 8 weeks til my camp opens up, and I have been sorting wood and cutting it into different sizes; kindling, stove, and smaller pieces for my biolite stove/grill. I have two saw horses and a tree stump about waist high. At camp I don’t have those things, so your tip is very useful. I had been using the techniques you showed in another article. Breaking branches around a tree and the planting your feet wide apart and using gravity method. Now I will give this one a try. Thanls! Thank you for a very clear and informative article and I am sure the blog will hone up my skills when the time comes again for my next adventure. Thanks for taking the time to explain this very useful technique. 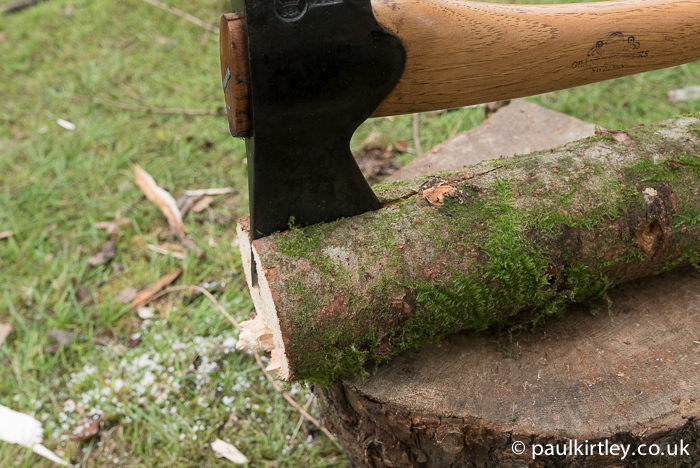 Hello Paul, i thought the ” Small wood splitting with an axe” pictures was very interesting and very informative and very useful, especially at this time of the year.Thanks for sharing, keep up all your hard work and effort. Kind regards David. 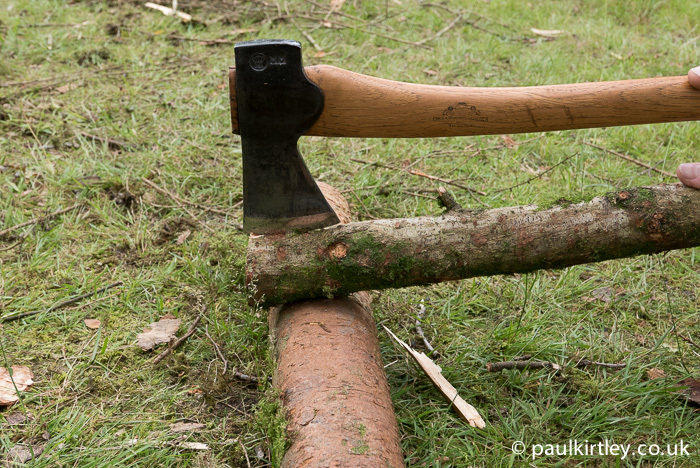 Excellent piece this Paul, one can’t emphasize enough, the importance of axe safety in the field. The information you provide, along with very helpful visual content, is absolutely brilliant. Thanks for taking the time and effort so we may all benefit and hopefully remain safe and sound while practicing this wonderful craft. It’s been a while since I’ve had a proper chance to sit and read one of your articles but this one has reminded me just why I should be making time for just that! Great in-depth information and really clear formatting. Fantastic work. Thanks once again for a Smashing video. 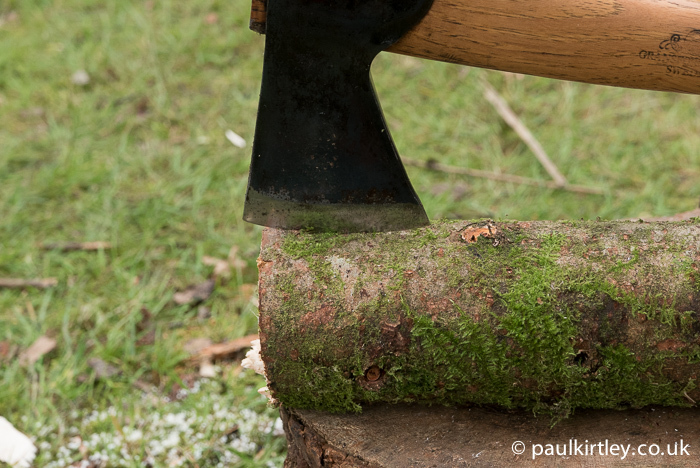 I recently purchased a Gransfors Bruks Small Forest Axe. I looked around for a long time for an all round good axe that I would benefit form, and after just about pulling my hair out i decided to settle for GB axe. 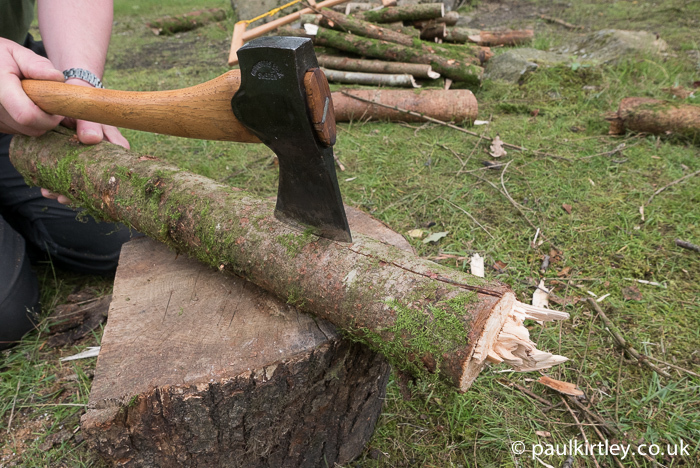 I will be out this Friday – Sunday trying my new axe and your technique for small wood splitting. I am right in saying you’re using the same axe as me in your video..? It looks so alike. Thanks for this Paul. Very useful photos I can use to demonstrate to students. Hi Paul, very good article. Very useful technique as I often face with lack of kindling when start a fire. Another plus is you always focus at safety. It is very important! Also with really good pictures I can’t go wrong! 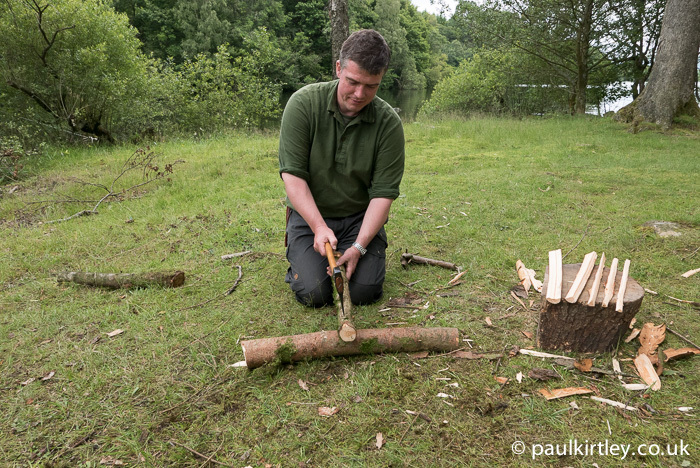 Once again an excellent demonstration, I have always split wood with what I thought was the safest and only way I knew how with a few near misses, so it has been a great help having such clear and guided instructions. Great article with plenty of info as always! Going camping in the mountains for two nights so I can try to get some tree I.D done so I’ll be using this technique then. Nice one Lee. I hope it was a good trip?